Maria Teresa Ortoleva is showing in E la luce fu at Galleria San Fedele, Piazza San Fedele, 4, Milano, from 28 September - 28 October 2017. See www.centrosanfedele.net. Felix Bahret has a solo show, Petit Bleu, at Gao Gallery, Unit 7, 88 Mile End Road, London E1 4UN, from 29 September - 1 November 2017. See www.gao.gallery. Deborah Padfield is speaking at Writing Chronic Pain: Movements and Fragments, a creative summit funded by the AHRC, at Lancaster University, on Saturday 21 October, from 9.20am - 5.30pm. For further details see: wp.lancs.ac.uk/translatingpain. 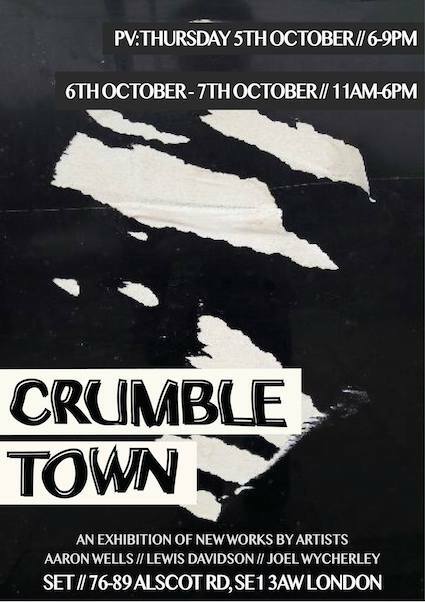 Clare Dorsett has a solo show, Spill Your Guts, at title.date.duration, unit 4, Phoenix House Ellesmere St, Manchester, from 12-6pm Saturday & Sunday, from 8 - 29 October 2017. See www.titledateduration.com. Maria Teresa is has been selected to show in Premio Cairo 2017 at Palazzo Reale, Piazza del Duomo, 12, 20122 Milan, from 24 October - 1 November 2017. See www.cairoeditore.it. 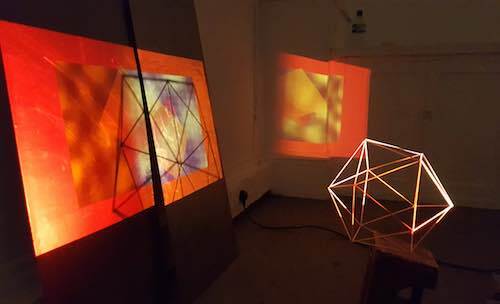 Bea Bonafini and Yvonne Feng are showing in Mise-en-Scène at Chelsea Waterside Artspace, Hepworth Court, Grosvenor Waterside, Gatliff Road, London SW1W 8QP, from 20 September – 15 November 2017. See www.chelseawaterside.org. Douglas Gordon's specially commissioned work, Black Burns, is showing at the Scottish National Portrait Gallery, 1 Queen Street, Edinburgh, EH2 1JD, until 29 October 2017. See www.nationalgalleries.org/exhibition. Shen Xin is showing a new work, Provocation of the Nightingale, at the BALTIC Artist's Award group show at BALTIC, Gateshead NE8 3BA, from 30 June - 1 October 2017. See www.balticmill.com. Joy Sleeman is speaking at Towards an Anthroplogy of Space - Orientating cosmological futures at the Institute of Advanced Studies, IAS Seminar Room 11, First Floor, South Wing, Wilkins Building, UCL, Gower Street, London WC1E 6BT, from 6 - 8pm on Monday 2 October 2017. See www.ucl.ac.uk/institute-of-advanced-studies. Phil Coy and Thomson & Craighead are showing in The New Observatory at FACT, 88 Wood Street, Liverpool L1 4DQ, from 22 June - 1 October 2017. See www.fact.co.uk/projects/the-new-observatory.aspx. Liz Rideal is speaking at The Roman Campagna: Digital Humanities Study Day, at the British School at Rome, Via Gramsci 61, Rome, on Friday 29 September 2017. See www.bsr.ac.uk/site2014. Work by Vanessa Bell, Dora Carrington, Duncan Grant, Oliver Messel and William Strang is included in Queer British Art 1861 - 1967, at Tate Britain, Millbank, London SW1P 4RG, from 5 April - 1 October 2017. See www.tate.org.uk. Steven Dickie and Benedict Drew are taking part in I Want My Ideal Paste at Kelder, Basement of Mercer & Co., 26A Chapel Market, London N1 9EN, from 28 September - 1 October 2017. Booking advised for some events. See kelderprojects.com. Luzia Hürzeler is showing in We Love Animals at Kunstmuseum Ravensburg, Burgstraße 9 , 88212 Ravensburg, Germany, from 1 July - 15 October 2017. See www.kunstmuseum-ravensburg.de. This year's e-book Slade Graduate Reseach 2016 - 17 is now available for download on www.ucl.ac.uk/slade/graduateresearch. Will Hurt and Jake Elwes are on the longlist for The Lumen Prize 2017. The winner will be announced on Wednesday 20 September 2017. See lumenprize.com/longlist-2017. Holly Hendry is showing Wrot at the Baltic Centre for Contemporary Art, Gateshead Quays, South Shore Road, Gateshead NE8 3BA, from 18 February - 24 September 2017. See www.balticmill.com. Anna Reading is showing in Loop at Lubomirov/Angus Hughes, 26 Lower Clapton Road, London, E5 0PD, from 9 September - 8 October 2017. See www.lubomirov-angus-hughes.com/Loop. Anna Reading is showing in Object 77b at LG London, 2 Hanway Place, London W1T 1HB, from 8 July - 16 September 2017. See www.lglondon.org. Deborah Padfield is speaking at Reforming Anatomy: The Interplay between Art & Surgery, at the Royal Society of Medicine, 1 Wimpole Street, London W1G 0AE, on Sunday 24th September 2017. See reforminganatomy.com. Work by Eileen Agar and Mona Hatoum are showing at Dreamers Awake, White Cube, 144-152 Bermondsey Street, London SE1 3TQ, from 28 June – 17 September 2017. See whitecube.com/exhibitions/dreamers_awake_bermondsey_2017. 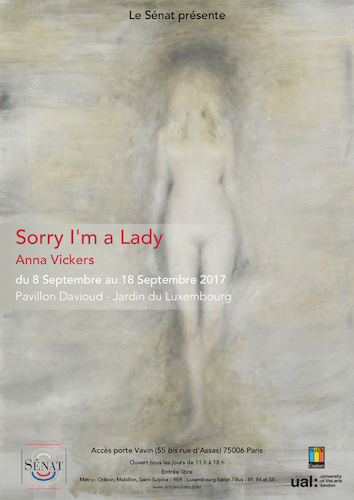 Anna Vickers has a solo show, Sorry I'm a Lady, at Pavillon Davioud, Jardin du Luxembourg, 55 bis rue d'Assas, 75006 Paris, from 8 - 18 September 2017. See http://annavickers.com/news.html. Alvaro Barrington, Hazel Brill and Siobhan Coen have been selected to take part in ARTAGON.III, an exhibition of recent graduating students from a selection of art schools, at Les Petites Serres, 18, rue Larrey, 75005 Paris, France, from 8 to 17 September 2017. See artagon.co/projects/artagon3/. Jayne Parker is showing in AVANT - Experimental Film Festival - Bodies and Boundaries, at Karlstad Cinema, Karlstad, Sweden, on 8 - 9 September 2017. See www.avantfilm.se/avant-2017-bodies-and-boundaries. 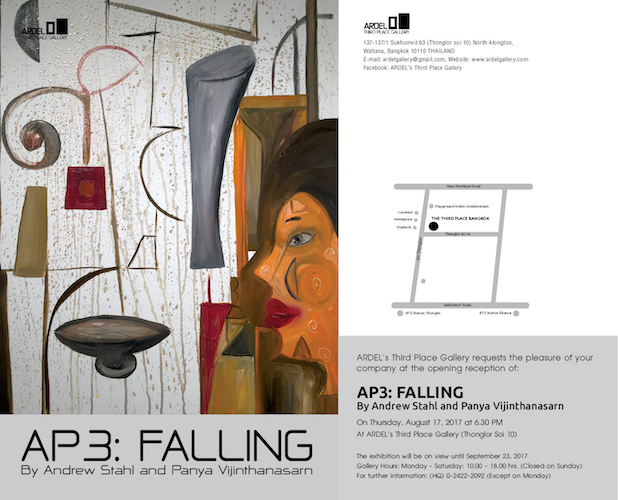 Andrew Stahl is showing in AP3: Falling at Ardel's Third Place Gallery, Thonglor Soi 10, Bangkok, Thailand, from 18 August - 23 September 2017. See www.ardelgallery.com. 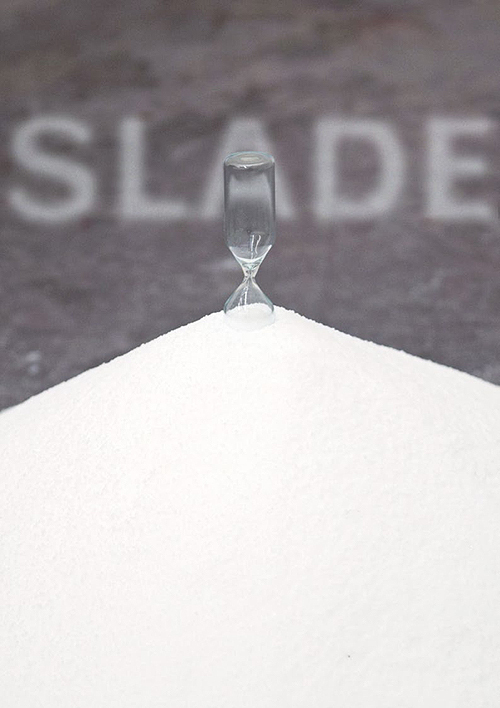 Spaces are still available for some Slade Summer School Short Courses 2017. Courses include a variety of evening, one and two-week courses including drawing, painting, photography and printmaking. See www.ucl.ac.uk/slade/shortcourses.